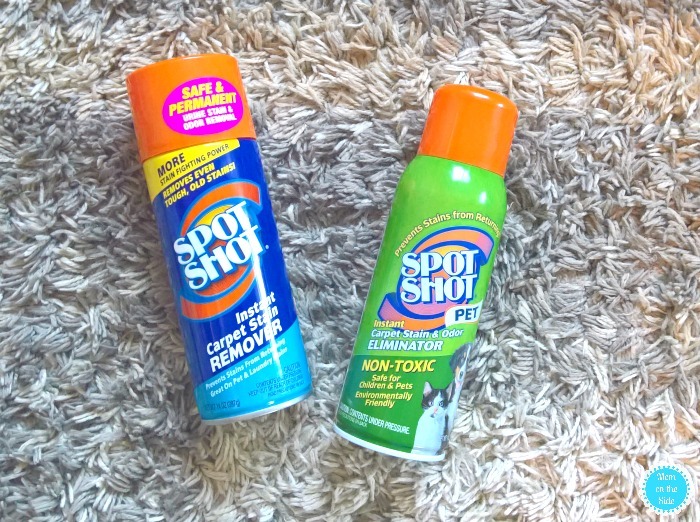 This post on Living Room Cleaning Hacks is sponsored by Spot Shot ® Instant Carpet Stain Remover. Any opinions are 100% my own. It’s no secret I love to clean and keep things organized. It’s also no secret that I like to save time cleaning so I can enjoy the rest of my day. My Weekly Cleaning Schedule keeps me on top of the mess but I also deep clean each room once a month. 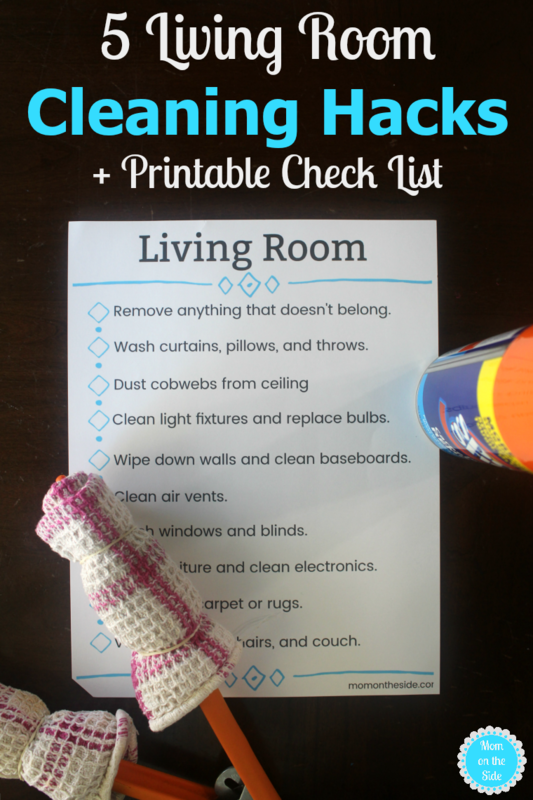 These 5 living room cleaning hacks and a printable living room cleaning checklist are how I tackle the job quickly. I hope they help you get the living room cleaned up in no time as well! 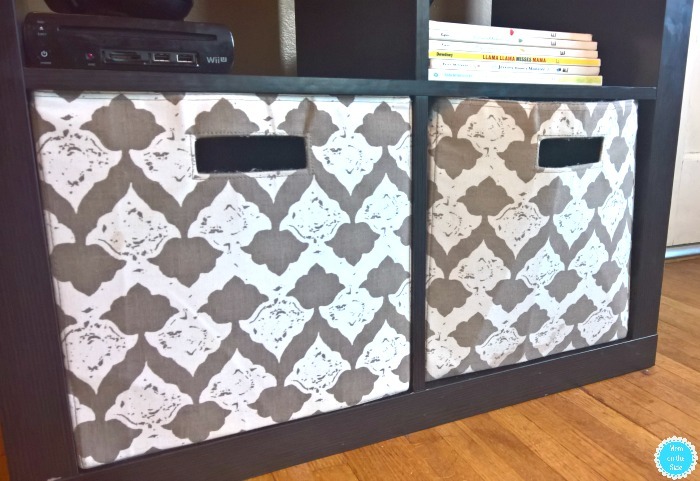 Having baskets for storage is especially helpful if you have little kids. They come in handy for corralling toys, magazines, or even movies. I picked our current TV stand because it has space for baskets and I can keep the daily clutter out of sight. 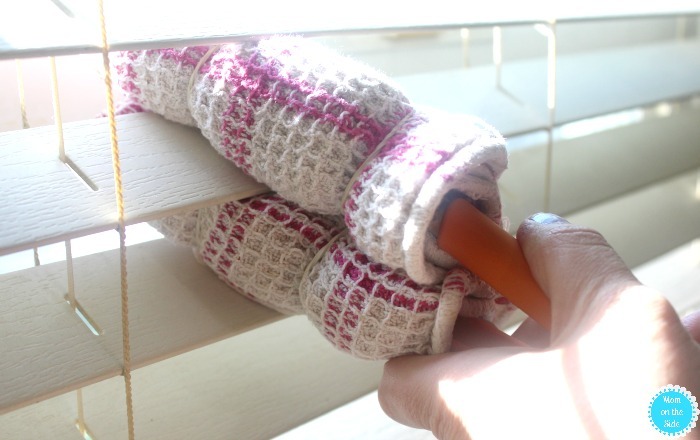 If you have wood blinds in your living room, here is a great cleaning hack for blinds! Wrap washcloths around tongs and hold them down with rubber bands. Now easily wipe down both sides of each slat using the tongs. We have cellular shades in the living room, which can easily be vacuumed with the dust attachment. To clean the insides of the honeycombs a can of air, or a blow-dryer set to low work great for blowing out dust. Air vents and toddlers do not mix well from a parent’s perspective. I’m still not quite sure what’s all been squeezed through the cracks over the years, and man do they get dirty! A simple air vent cleaning hack using a knife and cloth or wet wipe works great for cleaning all those little slats. Whether you have carpet in your living room or a rug like we do, keeping a carpet stain remover on hand is a life saver. Why I chose a beautiful light-colored rug with four-year-old twins running around is beyond me. I did and I love it so I’m a bit overprotective of it. Spot Shot® Instant Carpet Stain Remover is my go-to product when the kids stain the rug because it instantly powers out old and new stains, including pet stains, coffee, spaghetti sauce, grease and oil, marker, wine and more! Click here to find Spot Shot at a retailer near you and here to save $1.00 on your next Spot Shot purchase. For more cleaning tips, follow the Stain Fighting Community on Facebook! Cleaning baseboards might be my least favorite part of cleaning the living room. Really any room honestly. The get so dirty and ours have lines, holes, and cracks since they were installed when the house was built in 1946. A few cleaning hacks for baseboards are to use cotton swabs for holes and cracks and finish off with a dryer sheet wipe down. That will help repel dust and hair to make each cleaning easier. 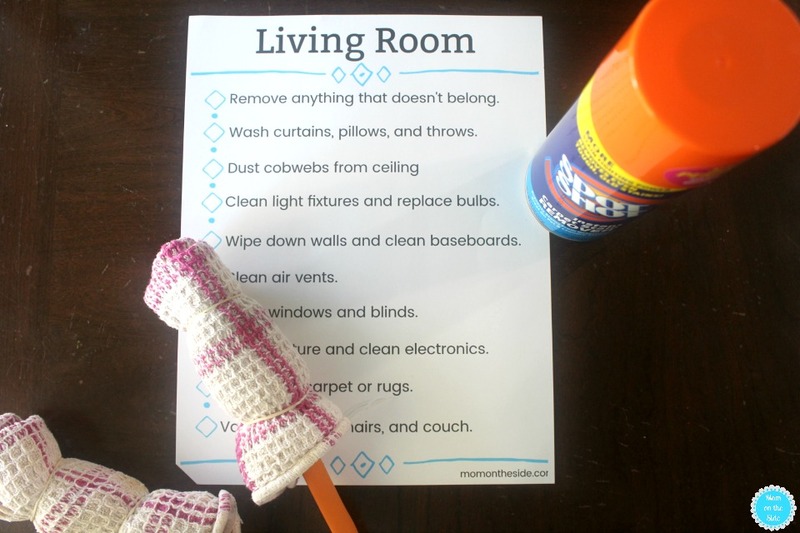 Grab my Living Room Cleaning Checklist and keep these tips in mind to make the job easier. This is going to be so helpful! Thank you for sharing this!